These are the best places for perfect sunsets, beautiful souvenir photos and unforgettable moments. 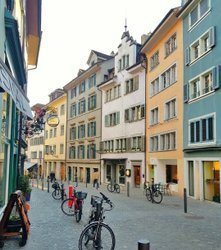 Whether sitting in a cafe, swimming in thermal baths, or reaching for the stars: these vantage points are where the most beautiful memories of Zurich are created. 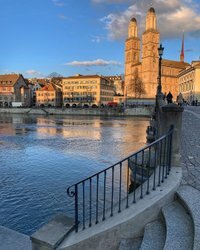 Anyone who wants to take the most attractive selfie with Zurich in the background, is looking for the perfect place for a marriage proposal, or simply wishes to view the City on the Limmat, with all its waterways and parks, from above, should be sure to visit these vantage points in Zurich. One of the most beautiful panoramas of Zurich’s city and lake can be enjoyed from Waid, located between the urban quarters of Wipkingen and Höngg. This view of the Old Town, Limmat and Lake Zurich is simply awesome: climb up the Karlsturm, one of the two towers of the Grossmünster Church. Fancy relaxing in warm water while looking out over the city? Not a problem at the Zurich Thermal Baths & Spa. Whether before, during or after purchasing an original Freitag bag, a visit to the roof of the tower is obligatory. Here, romantics can enjoy a 360° panorama of the city center. And in the Urania Observatory, one floor up, you can reach for the sun, moon and stars. Three different directions, three different perspectives of Zurich – that can be enjoyed from the terrace of the George Bar & Grill. 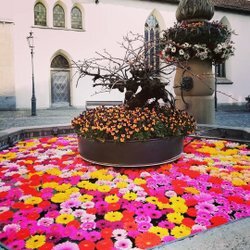 The historically important Lindenhof is a real oasis. It also offers the most beautiful views of the guild houses and the Grossmünster Church. On the 35th floor of the Prime Tower, guests are treated to delicious gin creations and a spectacular panorama of Zürich-West. A trip up the Uetliberg is an absolute must. And those who dare can climb to the top of the lookout tower and gain an additional 72 meters of view! A variety of campsites attract visitors into the nature around Zurich and Lake Zurich. In summer, what could be nicer on a stroll through the city than one of these delectable ice creams? Tips and excursion ideas for the summer months. Summer sees the return of the popular open-air bars to the city.